Son of a wealthy French wine merchant. Though his father wanted him to pursue the family business, Nicholas early discerned a call to religious life. On 25 March 1767, he entered the novitiate of the Brothers of Christian Schools, and took the name Solomon. A good student, recognized for his piety and deep prayer life. Spent several years teaching at various schools throughout France, and witnessed much of the political turmoil tearing his country apart. Director of novices for his community, and frequent correspondent with his brothers and sisters on matters spiritual. Procurator in the Congregation's motherhouse. Secretary to the superior general of the order. In the summer of 1792, Brother Solomon, along with many other priests and religious, was imprisoned, and martyred as part of the suppression of Christianity of the French Revolution. Born to the Italian nobility. Soldier in the army of Bergamo, Italy. Severely wounded in battle, he made the common offer to enter religious life if he was healed. 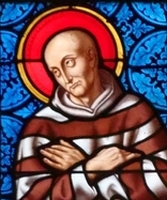 Albert recovered, made a pilgrimage to Santiago de Compostella, became a Benedictine monk, and c.1079, he returned to Pontida, Italy where he founded the Cluniac abbey of Saint James. 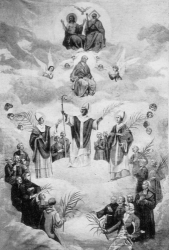 Its first abbot was Saint Vitus of Pontida who served while Albert studied the Cluniac reform in France. When Vitus died, Albert took over for as the second abbot. Born to the nobility; his family were French expatriates. Earned a doctorate in civil and canon law at age 17. Studied in Rome, Italy. Courtier to King Philip III in Madrid, Spain. Ordained a priest in 1610. Royal chaplain to Philip III for ten years. 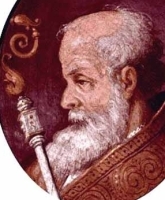 Bishop of the territorial prelature of Santa Lucia del Mela, Italy, confirmed by Pope Paul V, from 12 November 1616 until his death. Counselor and chaplain to the court of the kingom of Sicily. For all his time spent in royal and noble courts, Father Antonio was known to his ascetic life, sleeping on the bare ground or floor, eating little and plainly, his concern for piety and penance, a ministry to the poor and sick, and work with people who were victims of loan sharks. Son of Saint Magnus of Avignon, a Gallo-Roman senator who became a monk and then bishop. Agricola moved to Lerins, France, his father's see, at age 14. Monk there at age 16. Ordained in Lerins. Co-bishop of Avignon with his father in 660. Bishop in 670. Built a church and Benedictine convent in Avignon, the church staffed with his brother monks. Noted preacher, and famous for his charity and defense of the poor and sick against civil authorities. His blessing ended an invasion of storks, leading to his patronage of them, and his emblem in art. His prayers were said to produce rain, good weather and fine harvests. Spiritual student of Father Peter of Dacia, a Dominican. Ingrid became the first Dominican nun in Sweden, and founded the first Dominican cloister in Sweden, Saint Martins in Skänninge in 1281; it was destroyed during the Reformation. Born to the French nobility, the son of the lord of Maumont Jean de La Rochefoucauld and Marguerite des Escots; his brother Francois-Joseph became bishop of Beauvais, France, and his sister was abbess of the convent of Notre Dame de Soissons. Priest. Prior commendator of Nanteuil, France in 1770. Chosen general agent of the clergy in 1775. Bishop of Saintes, France in 1781. Organized a bank that functioned like modern fire insurance. Elected deputy of the clergy to the general states for the Sénéchaussée de Saintes on 24 March 1789. One of the Martyrs of September, killed in the anti–Christian excesses of the French Revolution. Jesuit priest. Taught at several schools. When the Jesuits were suppressed in France, he was able to continue his priestly ministry under the protection of the Duke of Lorraine. Upon the death of the duke, Father Alexander travelled to Vienna, Austria where he served as preacher in the court of Empress Maria Theresa. In 1789 he returned to Paris, France, where he served for two years as confessor to King Louis XVI. Arrested in the persecutions of the French Revolution for his faith, his priesthood and the assumed influence he had over the king. One of the Martyrs of September. Abbot in Asia Minor. Hermit in a cave on Mount Luca, Cappadocia for over twenty years. His reputation for holiness attracted many disciples. Worked as a teenage maid at inn in Louvain, Belgium owned by a relative named Aubert. Aubert and his wife eventually sold the inn, each planning to enter religious life; Margaret planned to become a Cistercian nun. On their last night in the inn, thieves broke in and killed the erstwhile owners while Margaret was out. She came home as the killers were leaving, and she was murdered, too. Devotion developed after miracles occurred near her original gravesite beside the river. Priest. Court chaplain to King Canute of England and Denmark. During a trip to Denmark, William saw a crying need for Christian missionaries, and he worked there the rest of his life. Bishop of Roskilde, Zeeland. He decreed that a person who had shed blood unjustly could not receive the sacraments until he had done public penance. King Sweyn, who was one of the targets of this order, came to the cathedral with armed men. William stood at the door, armed only with his crozier. When the guards threatened to attack him, William offered no resistence. Sweyn asked forgiveness, and gave the church a gift of lands in token his penance. Monk on Mount Carmel. Prior of his house. He asked Saint Albert, patriarch of Jerusalem, to write a Rule for the monks. In 1195 his Rule became the foundation for the Carmelite Order. Pope Honorius III objected to its use because it did not have his prior approval. The Pope received a vision of the Blessed Virgin Mary who supported the rule; Honorius gave his approval. Brocard ruled his house for 35 years, setting an example for devotion to the Rule, and gaining great respect from the region's Muslims. Deacon at Vienne, France. Bishop of Lyons, France in 374. Presided over the Council of Aquileia in 381. Opposed Arianism. Friend of Saint Ambrose. 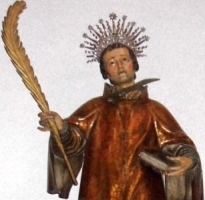 When a violently insane criminal sought sanctuary in the cathedral after attacking people in the street, yet was still killed by an avenging mob, Justus, along with his assistant Saint Viator, left his see in disillusion. The two spent the rest of their days as prayerful hermits in the desert near Alexandria, Egypt. First century convert to Christianity. Pilgim to Rome, Italy. Priest. Missionary to Aquitania, an area of modern France, which led to his title Apostle of the Rouergue. Miracle worker. Benedictine monk. Friend and fellow student of Blessed Albert of Pontida. 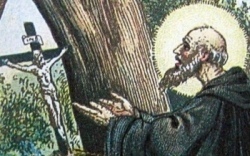 First abbot of the Cluniac abbey of Saint James in Pontida, Italy. Nun, receiving the veil from Saint Aidan of Lindesfarne. Abbess at Tadcaster, Yorkshire, England. Some writings identify her with Saint Bega. Stonemason in predominently pagan Aribazus, Syria. He denounced their non-Christian practices of neighbors, and became a hermit for two years. He then returned to his village and destroyed the pagan idols there. He afterwards moved to Apamea, Syria where he built a church. Martyr. Benedictine monk at the monastery of Mount Soracte, Italy. Pope Saint Gregory the Great wrote about him. Deacon. Martyred in the persecutions of Emperor Licinius. 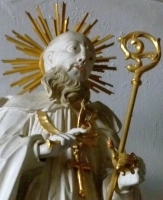 Bishop of Autun, France c.560. Known for his learning and zeal for the faith in the councils he attended. Fifth century bishop of Vercelli, Italy for nine years. Third son of Old Testament Patriarch Aaron. Leader of the Jewish theocracy. With his brother Ithamar, he founded the Israelite priestly class. Old Testament patriarch. Bishop of Lyons, France from 410. Hermit on the island of Candia (modern Crete). Fourth Bishop of Strasbourg, Alsace, France in the 4th century. Slave in imperial Rome. 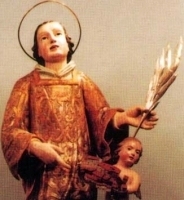 Martyred with Saint Ansanus in the persecutions of Diocletian. Three Christians who were martyred together in the persecutions of Diocletian. No details about them but their names have survived – Concordius, Theodore and Zenone. A group of ten Christian martyrs; their names are on old martyrologies, but we have lost all record of their lives and deaths.